God’s Light, beautiful cumulus nimbus clouds with rays of sun streaming down. I went to Louisville yesterday to visit the St. James Art Fair. I exhibited in the fair for many years but haven’t been back since I quit exhibiting. It was exciting to meet up with old friends and to see the new trends in art. Quality art is always popular no matter the materials or subject. The day was beautiful with temps near the 90s. Unseasonably warm for October. This heat can make some very unstable air and weather conditions. On the trip home, I was admiring the beautiful cumulus nimbus cloud formations. Gigantic fortresses of white against a brilliant blue sky. Some of the clouds were dropping rain which was evaporating before it could hit the ground. This is a photo of one of the clouds which I took out my window. (Don’t try this at home, folks.) 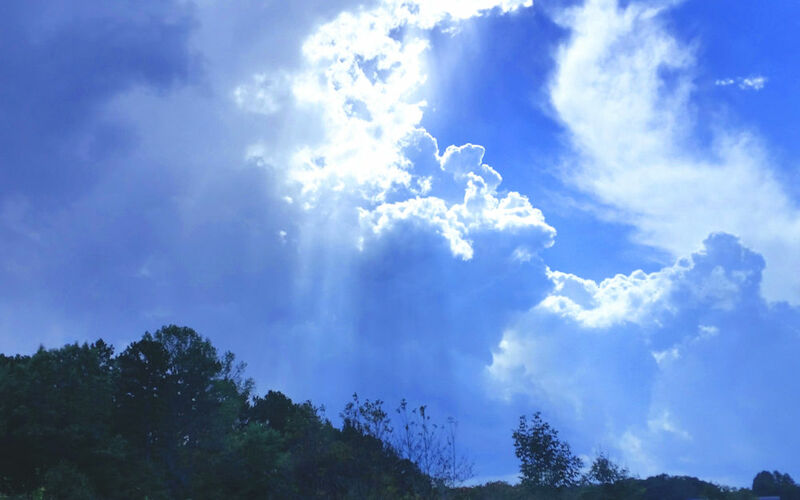 Artists often call the rays of sunlight streaming through the clouds God’s Light. Easy to visualize but difficult to paint. I just love clouds and have painted many, so I guess this one will be on my to-do list of painting subjects in the future. Occasionally here in the Midwest we get some pretty fabulous cloud formations. They’re probably not any different than anywhere else, it’s just that we actually have the space to see them. 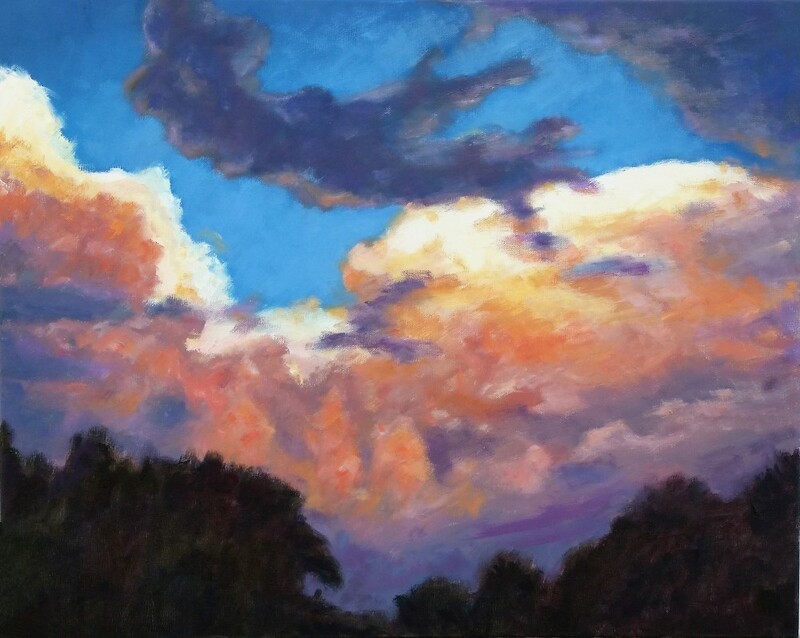 This painting is from a photo that my son shared with me of some dramatic cumulonimbus clouds in August. Interestingly enough, I was taking photos of the same clouds from two miles away as was another friend who lives about 30 miles away. That’s how impressive the formations were. I decided to turn it into a painting for my son for Christmas. I don’t think he follows my blog or otherwise, this won’t be a surprise for him.